Our aluminum division focuses on aluminum extrusion fabrication for residential and commercial properties. We offer new build construction from concept to completion. Renovation and alterations are also a huge percentage of our business. Most jobs come by way of referral. Two main qualities we continue to hear are our dependability and integrity. “I received five quotes for my composite roof and screened enclosure. Graco was not the cheapest but quickly separated themselves with their service and professionalism. Larry actually caught a mistake in the drawings that was missed by the engineer and the county. The permit had been issued and Larry still went back to the county department to show them the mistake and have it corrected in the plans. “I had a good feeling about this company as soon as I spoke with them on the phone. They built a composite roof system inside our existing pool cage for shade and resurfaced our pool deck. Want to schedule an estimate? Please fill in our short contact form. Just finished a concrete patio in Riverview, FL for BJ Johnson and Lindsey Hilgendorf. BJ is the driver for Gas Monkey monster truck and Lindsey is crew chief. Just started an E commerce storefront on Angie's List with a great discount to all Angie's List members. We now offer screened enclosure construction. 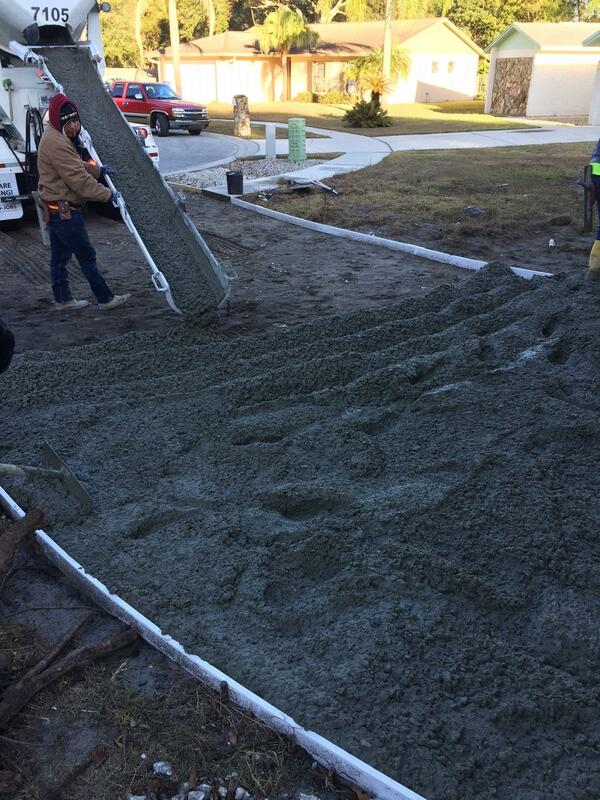 Concrete driveway replacement in Brandon, Florida by Graco Construction. Each of our employees has been certified by Graco for specific specialties. We match the appropriate crew for each individual project. All of our labor pricing is structured based on the services your project requires. You can rest easy knowing that we strive to be as competitive as possible. We know how busy life can be. So, we do our best to work with our clients and schedule the work to be most convenient for them and their family. We are licensed, insured and bonded by the state. We E-verify every employee. All employees have passed an extensive back ground check.